(21596, Oklahoma Historical Society Photograph Collection, OHS). KEATING, FRANCIS ANTHONY II (1944– ). 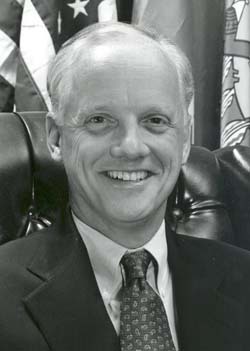 Oklahoma's governor from 1995 through 2002, Frank Keating was one of twin sons born on February 10, 1944, in St. Louis, Missouri, into the family of Anne Martin and Anthony Francis Keating. In that year the Keatings, a prominent oil family, moved to Tulsa, Oklahoma, where Frank Keating attended private schools and graduated from Cascia Hall High School. After graduating from Georgetown University in Washington, D.C., in 1966, he received a law degree from the University of Oklahoma in 1969. During a lengthy career as a public servant Keating held positions with the Federal Bureau of Investigations and as assistant district attorney in Tulsa. In 1972 he married Catherine Heller, an Oklahoma native, and the union produced two daughters and a son. A Republican, Keating served in the Oklahoma House of Representatives from District 70 in 1973–74 and in the Senate, representing District 38 from 1975 to 1981 and becoming minority leader. In 1981 he became U.S. attorney for the Northern District of Oklahoma. From 1986 to 1988 he served as assistant secretary of the U.S. Treasury and in 1988–89 as associate U.S. attorney general before moving into the position of general counsel for the U.S. Department of Housing and Urban Development in 1991–93. Returning to Oklahoma to run for governor, he was elected in 1994, defeating Democrat and former lieutenant governor Jack Mildren and independent Wes Watkins. Keating was reelected in 1998. He received national recognition for leading the state's recovery efforts after the April 19, 1995, bombing of the Alfred P. Murrah Federal Office Building in Oklahoma City. Only the third Republican since statehood to hold the governor's office and the state's only governor to have served in both houses of the legislature, he was responsible for the largest tax reduction in Oklahoma history. Reforms in the education system, the state purchasing system, and the worker's compensation laws came about during his administration, and in 2002 a dome was added to the Oklahoma Capitol. After completing his second term as governor, Keating resided and worked in Washington, D.C.
Daily Oklahoman (Oklahoma City), 24 August 1994 and 13 November 1994. "Frank Keating," Vertical File, Research Division, Oklahoma Historical Society, Oklahoma City. Oklahoma Almanac, 1997–98 (Oklahoma City: Oklahoma Department of Libraries, 1998). Dianna Everett, "Keating, Francis Anthony II," The Encyclopedia of Oklahoma History and Culture, https://www.okhistory.org/publications/enc/entry.php?entry=KE001.